I’ve just recently finished up a Windows Phone 7 (WP7) development project at work, and during the project I collated a number of tips and useful resources that helped make the project a success, and I’m going to share those with you in this post. If you want to check out exactly what the marketplace submission process entails, the App Hub website has a very detailed walkthrough of the process. Thankfully, it’s not difficult; you just need to provide your XAP, some descriptions, some artwork and set your pricing. One of the big questions you get asked as a Windows Phone developer is how long it will take for your application to be published on the Marketplace after it’s been submitted. Microsoft recently released some official numbers around that, and they claim that the average time to certification is 1.8 days. Of course, that’s an average, so you shouldn’t rely on that for your planning. Microsoft could take longer if they’re inundated with submissions. That same numbers blog post also says that 62% of applications pass on the first attempt. That means around 40% of apps fail, so you should allocate some time in your schedule to handle a potential submission failure. The coroutines support is awesome and allowed me to write asynchronous code in a non-asynchronous fashion while still actually doing operations asynchronously. If you’ve read about C# 5’s await support, this is sort of like that except implemented using iterator blocks. One thing I’ve realised about MVVM is that it doesn’t describe a solution to the entire problem, which also includes navigation between, and composition of, views. Caliburn Micro has a concept called Conductors that helps with this, and it also abstracts the WP7 navigation functionality away from you. Tombstoning in WP7 can be a pain, but Caliburn Micro makes it relatively easy. You simply apply attributes to properties in your view model that you want saved when your app gets tombstoned, and Caliburn Micro will automatically restore those properties’ values when your application is restored. It also helps you when you’re using WP7 Tasks that cause your app to get tombstoned before they return you some data the user selected. I have a love-hate relationship with Caliburn Micro’s conventions-based data binding. It allows you to omit explicitly defined bindings in your view and Caliburn Micro will do it automatically for you based of its extensible conventions. On the one hand, it makes data binding easy; in particular commanding with ICommand, as it can just link an event in your view and a method on your view model automatically (and run that method as a coroutine, if you like). On the other hand, when something goes wrong, it’s much more difficult to find out why the black magic isn’t working. The biggest disadvantage to Caliburn Micro is that it adds quite a lot of advanced techniques to your toolbox, which is great if you’re experienced, but can make it harder for people new to your project and unfamiliar with Caliburn Micro to get started. The other disadvantage is that the documentation (at the time of writing) is okay, but in a lot of cases I found I needed to dig through Caliburn Micro’s source code myself to see what was going on. (Tip: create and use a debug build of Caliburn Micro when debugging it, since the Release builds optimise out a lot of methods and make stepping through its code difficult. But don’t forget to switch back to the Release build when you publish to Marketplace). The default WP7 SDK is strangely missing some of the controls you expect to see there to make a good WP7 application look and feel like the native apps that come on the phone. Turns out that stuff is, for some reason, inside the Silverlight for Windows Phone Toolkit. The toolkit gets you those basic, expected things like the animated transitions between pages, the subtle tilting effect on buttons when you touch them, context menus, date pickers, list pickers, an easier API for gestures, etc. The best way to learn how to use the stuff in the toolkit is to download the Source & Sample package and take a careful look at the sample code. WP7 comes with a lot of theming resources that you can reference using the StaticResource markup extension. Keep this MSDN page open in your browser while developing and use it as a reference. I highly recommend you use them everywhere you can, because they help keep your application’s look and feel consistent to the WP7 standards, and also come with the side effect of making your application automatically compatible with the user’s chosen background style (light/dark) and accent colour. So when the user selects black text on a white background, your text will automatically apply that styling. Neat! While testing your application, I would encourage you to regularly switch between the different background styles and accent colours to make sure your application looks good no matter what theme the user chooses. The SDK comes with a library of icons you can use in your application, saved in C:\Program Files (x86)\Microsoft SDKs\Windows Phone\v7.0\Icons. Take advantage of them to ensure your icons are consistent with the WP7 look & feel and are familiar to your users. As far as I can tell, WP7 seems to automatically and transparently cache HTTP requests for you based off their caching HTTP headers. This doesn’t seem to be documented on the HttpWebRequest class page, but at least one other person has noticed this behaviour. So if you’re calling a REST service and that REST service is setting cache headers saying cache the result for a day, your users won’t see new data for a day. Keep this in mind and perhaps change your service’s caching headers. To use the DataStateSwitchBehavior, you will also need to take the BindingListener class, the ConverterHelper class, and the GoToState class. In the example above I’m binding to a bool, but it even works if you bind to an enum. While testing your application on a hardware device, you’ll likely be testing it while connected to the PC and the Zune software. However, for some reason the MediaElement control will fail with the AG_E_NETWORK_ERROR when you try to use it. Don’t panic, simply disconnect your phone from the Zune software and try again, or try connecting your phone using the WPConnect tool (C:\Program Files (x86)\Microsoft SDKs\Windows Phone\v7.0\Tools\WPConnect\WPConnect.exe) instead of Zune. Be kind to your users and show them a nice error message telling them to try disconnecting their phones from Zune if you detect that error. There are reports on the Internet that the Pivot control has crashing issues when setting its SelectedIndex. Caliburn Micro has a PivotFix class in its WP7 samples you can use to work around it, plus you might like to try the workarounds on this page. However, if you still can’t get it to work (like I couldn’t), try simply slicing and reordering the array of pivot items so the one you want selected is first, which avoids this issue. For example, if you want pivot item C to be first, reorder A,B,C,D,E into C,D,E,A,B. Your users won’t notice the difference since the Pivot control automatically wraps the end of the list to the start and vice versa. I found it very difficult to tell that it was the Pivot control causing the crashes; my application would trigger a break by the debugger in the App.xaml.cs’s unhandled exception handler method and the exception’s description would be “The parameter is incorrect” and there would be no stack trace (??!). If you see this exception, investigate how you’re using your Pivot control. Everyone loves infinite scrolling of lists, where more content in the list is loaded dynamically as you scroll down. 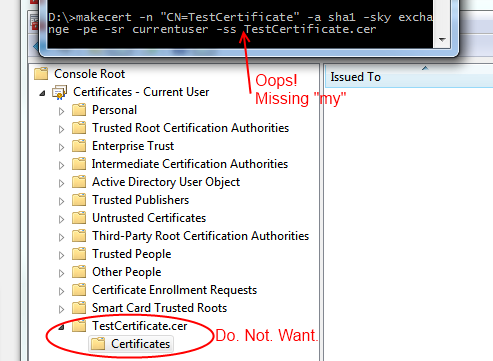 Unfortunately, WP7’s SDK doesn’t give you any help out of the box in regards to doing this. Thankfully, Daniel Vaughan has developed a neat attached property you can attach to list boxes that will call a data bound ICommand when the user scrolls to the bottom of the list. You can use this to load more data into the ListBox. Daniel’s ScrollViewerMonitor class uses a BindingListener class, which isn’t the same class as the one you’ve borrowed from Expression Blend Samples, but you can easily modify his code to use that class instead. Be aware that infinite scrolling will likely require careful monitoring of your memory usage (WP7’s max is currently 90MB for phones with 256MB of RAM); you will probably need to put an upper limit on how far you can scroll. It will probably also mean you’ll be using a VirtualizedStackPanel inside of your ListBox (that’s the default) to keep memory usage down, but keep in mind the performance for scrolling rapidly up and down in a VirtualizedStackPanel-powered ListBox is poor on WP7 at the moment. A typical case where you’d want to hide the system tray using visual states is when you’ve got a visual state group for device orientation (ie Portrait and Landscape. Use a DataStateSwitchBehavior and bind it to the Page’s Orientation property). Visual states use animations to change properties on objects, but unfortunately animations in XAML don’t work with “custom” attached properties, such as shell:SystemTray.IsVisible. I highly recommend hiding the system tray when in landscape orientation, because it takes up a ridiculous amount of room on the side of the screen and looks horrible. WP7 is a great platform to develop on because it’s Silverlight; it means if you’ve got some Silverlight (or WPF) experience you can be instantly productive. However, there are some limitations to the platform at the moment and for some things you need to go outside the box to be able to achieve them. Hopefully this post has made some of that easier for you. Recently I’ve been writing a small WPF application for work where the goal is to be able to allow its users to download a single .exe file onto a server machine they are working on, use the executable, then delete it once they are done on that server. The servers in question have a strict software installation policy, so this application cannot have an installer and therefore must be as easy to ‘deploy’ as possible. Unfortunately, pretty much every .NET project is always going to reference some 3rd party assemblies that will be placed alongside the executable upon deploy. Microsoft has a tool called ILMerge that is capable of merging .NET assemblies together, except that it is unable to do so for WPF assemblies, since they contain XAML which contains baked in assembly references. While thinking about the issue, I supposed that I could’ve simply provided our users with a zip file that contained a folder with the WPF executable and its referenced assemblies inside it, and get them to extract that, go into the folder and find and run the executable, but that just felt dirty. Searching around the internet found me a very useful post by an adventuring New Zealander, which introduced me to the idea of storing the referenced assemblies inside the WPF executable as embedded resources, and then using an assembly resolution hook to load the the assembly out of the resources and provide it to the CLR for use. Unfortunately, our swashbuckling New Zealander’s code didn’t work for my particular project, as it set up the assembly resolution hook after my application was trying to find its assemblies. He also didn’t mention a clean way of automatically including those referenced assemblies as resources, which I wanted as I didn’t want to be manually including my assemblies as resources in my project file. However, his blog post planted the seed of what is to come, so props to him for that. The AfterResolveReferences target is a target defined by the normal build process, but deliberately left empty so you can override it and inject your own logic into the build. It happens after the ResolveAssemblyReference task is run; that task follows up your project references and determines their physical locations and other properties, and it just happens to output the ReferenceCopyLocalPaths item which contains the paths of all the assemblies that are copy-local assemblies. So our task above creates a new EmbeddedResource item for each of these paths, excluding all the paths that are not to .dll files (for example, the associated .pdb and .xml files). The name of the embedded resource (the LogicalName) is set to be the path and filename of the assembly file. Why the path and not just the filename, you ask? 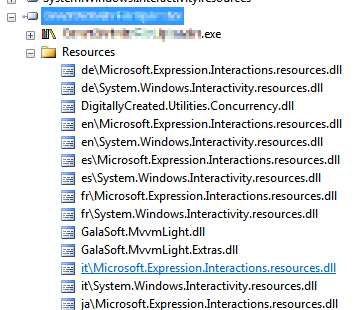 Well, some assemblies are put under subdirectories in your bin folder because they have the same file name, but differ in culture (for example, Microsoft.Expression.Interactions.resources.dll & System.Windows.Interactivity.resources.dll). If we didn’t include the path in the resource name, we would get conflicting resource names. The results of this MSBuild task can be seen in Figure 1. 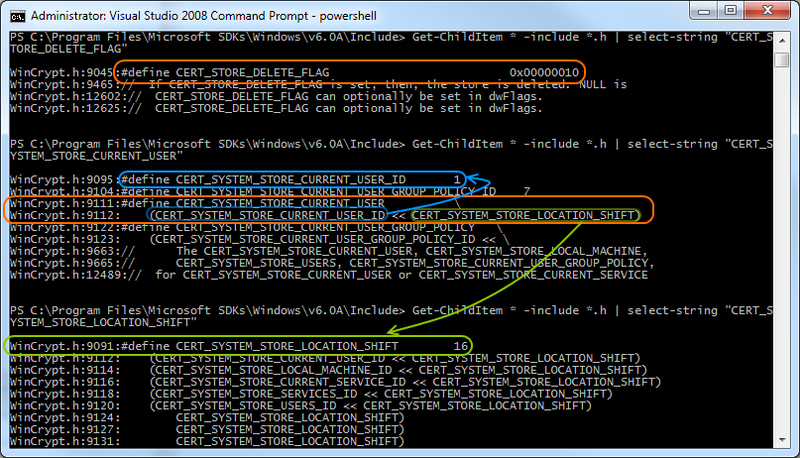 The code above registers for the AssemblyResolve event off of the current application domain. That event is fired when the CLR is unable to locate a referenced assembly and allows you to provide it with one. The code checks if the wanted assembly has a non-invariant culture and if it does, attempts to load it from the “subfolder” (really just a prefix on the resource name) named after the culture. This bit is what I assume .NET does when it looks for those assemblies normally, but I haven’t seen any documentation to confirm it, so keep an eye on that part’s behaviour when you use it. The code then goes on to load the assembly out of the resources and return it to the framework for use. This code is slightly improved from our daring New Zealander’s code (other than the culture behaviour) as it handles the case where the assembly can’t be found in the resources and simply returns null (after which your program will crash with an exception complaining about the missing assembly, which is a tad clearer than the NullReferenceException you would have got otherwise). In conclusion, all these changes together mean you can simply hit build in your project and the necessary assemblies will be automatically included as resources in your executable to be pulled out at runtime and loaded by the assembly resolution hook. This means you can simply copy just your executable to any location without its associated referenced assemblies and it will run just fine. Publish to File System took me a while to nut out because I expected some sensible use of MSBuild to be occurring. Instead, VS2010 does something quite weird: it calls on MSBuild to perform a sort of half-deploy that prepares the web app’s files in your project’s obj folder, then it seems to do a manual copy of those files (ie. outside of MSBuild) into your target publish folder. This is really whack behaviour because MSBuild is designed to copy files around (and other build-related things), so it’d make sense if the whole process was just one MSBuild target that VS2010 called on, not a target then a manual copy. Note that you can omit the DesktopBuildPackageLocation property from the command line if you’ve already set it by setting something using the VS2010 Package/Publish Web project properties UI (setting the “Location where package will be created” textbox). 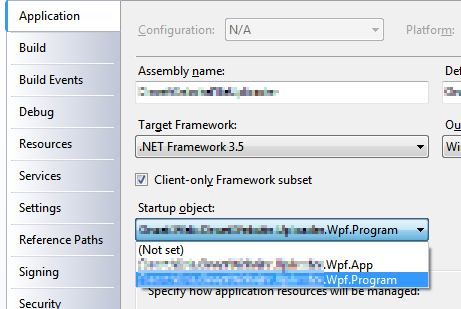 If you omit it without customising the value in the VS project properties UI, the location will be defaulted to the project’s obj\YourCurrentConfigurationHere\Package folder. In conclusion, we’ve seen how it’s fairly easy to configure your project file to support publishing your ASP.NET web application to a local file system directory using MSBuild from the command line, just like Visual Studio 2010 does (fairly easy once the hard investigative work is done!). We’ve also seen how you can use MSBuild at the command-line to build a deployment package. Using this new knowledge you can now open your project up to the world of automation, where you could, for example, get your continuous integration server to create deployable builds of your web application for you upon each commit to your source control repository. If you are using the default ASP.NET custom error pages, chances are your site is returning the incorrect HTTP status codes for the errors that your users are experiencing (hopefully as few as possible!). Sure, your users see a pretty error page just fine, but your users aren’t always flesh and blood. Search engine crawlers are also your users (in a sense), and they don’t care about the pretty pictures and funny one-liners on your error pages; they care about the HTTP status codes returned. For example, if a request for a page that was removed consistently returns a 404 status code, a search engine will remove it from its index. However, if it doesn’t and instead returns the wrong error code, the search engine may leave the page in its index. This is what happens if your non-existent pages don't return the correct status code! As you can see, the request for /ThisPageDoesNotExist returned 302 and redirected the browser to the error page specified in the config (/Pages/Error404), but that page returned 200, which is the code for a successful request! Our human users wouldn’t notice a thing, as they’d see the error page displayed in their browser, but any search engine crawler would think that the page existed just fine because of the 200 status code! And this problem also occurs for other status codes, like 500 (Internal Server Error). Clearly, we have an issue here. Unfortunately, this trick doesn’t work with ASP.NET MVC, as the method by which the response is rewritten using the specified error page doesn’t play nicely with MVC routes. One workaround is to use static HTML pages for your error pages; this sidesteps MVC routing, but also means you can’t use your master pages, making it a pretty crap solution. The easiest workaround I’ve found is to defenestrate ASP.NET custom errors and handle the errors manually through a bit of trickery in the Global.asax. In Application_Error, we’re checking the setting in Web.config to see whether custom errors have been turned on or not. If they have been, we call ShowCustomErrorPage and pass in the exception. In ShowCustomErrorPage, we convert any non-HttpException into a 500-coded error (Internal Server Error). We then clear any existing response and set up some route values that we’ll be using to call into MVC controller-land later. Depending on which HTTP status code we’re dealing with (pulled from the HttpException), we target a different action method, and in the case that we’re dealing with an unexpected status code, we also pass across the status code as a route value (so that view can set the correct HTTP status code to use, etc). We then clear the error and new up our MVC controller, then execute it. Now we’ll define that ErrorController that we used in the Global.asax. This controller is pretty simple except for the PreventDirectAccessAttribute that we’re using there. This attribute is an IAuthorizationFilter which basically forces the use of the Error404 view if any of the action methods was called through a normal request (ie. if someone tried to browse to /Error/ServerError). This effectively hides the existence of the ErrorController. The attribute knows that the action method is being called through the error event in the Global.asax by looking for the “fromAppErrorEvent” route value that we explicitly set in ShowCustomErrorPage. This route value is not set by the normal routing rules and therefore is missing from a normal page request (ie. requests to /Error/ServerError etc). In the Web.config, we can now delete most of the customErrors element; the only thing we keep is the mode switch, which still works thanks to the if condition we put in Application_Error. If we now look at the Fiddler trace, we see the problem has been solved; the redirect is gone and the page correctly returns a 404 status code. In conclusion, we’ve looked at a way to solve ASP.NET custom error pages returning incorrect HTTP status codes to the user. For ASP.NET Forms users the solution was easy, but for ASP.NET MVC users some extra manual work needed to be done. These fixes ensure that search engines that trawl your website don’t treat any error pages they encounter (such as a 404 Page Not Found error page) as actual pages.